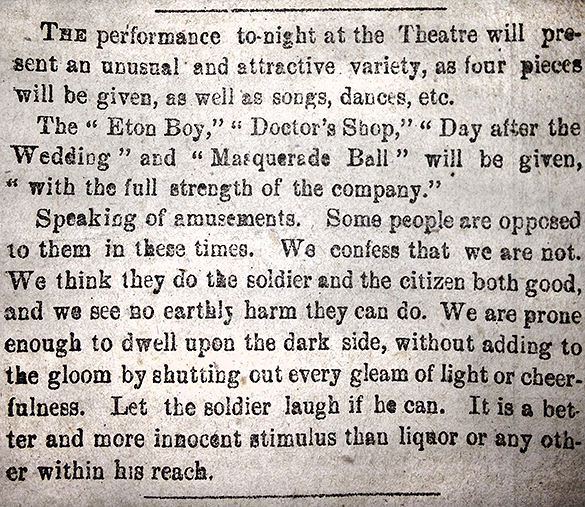 Item Description: editorial, The Daily Journal (Wilmington, N. C.), Thursday, 2 April 1863, page 2, column 1.
will be given, as well as songs, dances, etc. to them in these times. We confess that we are not. Citation: The Daily Journal (Wilmington, N. C.), Thursday, 2 April 1863, page 2, column 1. Bound in: “North Carolina Newspapers,” 1863; call number C071 Z, North Carolina Collection, Wilson Library, University of North Carolina at Chapel Hill. This entry was posted in North Carolina Collection and tagged entertainment, newspapers, The Daily Journal, theater. Bookmark the permalink.